The Forest Reversion Plan, consists of a selective thinning of the "exotic species"
(Eucalyptus, Pinus etc. 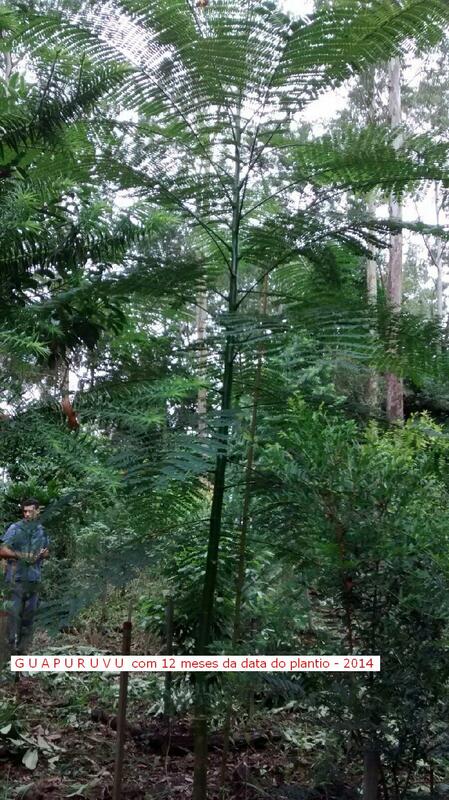 ), and subsequent replanting with Atlantic forest native species. 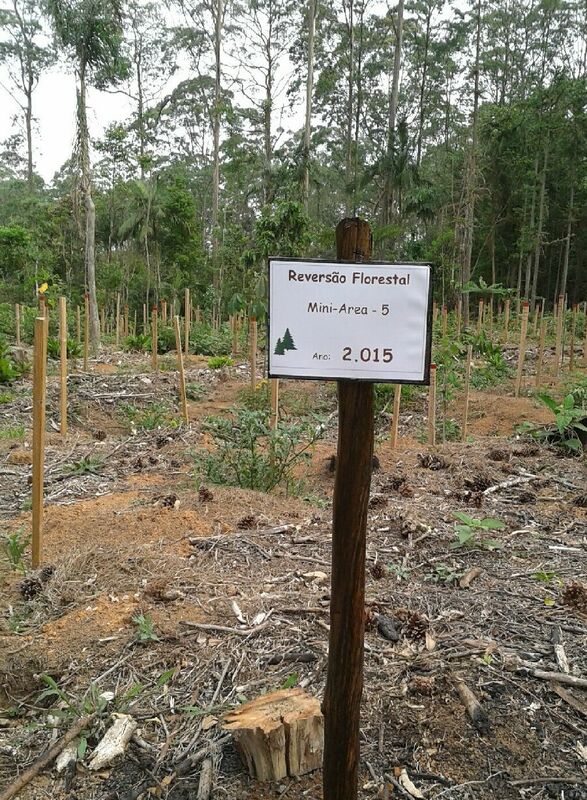 This is being carried out at the Castanheiras Reserve, systematically & voluntarily since 2004. It is, one may say, "a sample" of what 'could' be done in Brazil (a model) as one way of environment preservation, which demands many years for its effective conclusion. It is being done gradually, in order not to harm wildlife in the region and its surroundings. Each year an area of ​​about 2 Hectares (20,000 m²) is chosen, at the northern side of the property. A careful thinning is executed among the exotic species, in a way of not to harm the already existing undergrowth of native species originated through natural seeds'dispersion. Subsequently selected native seedlings are planted. A register of records of the planted seedlings is maintained on file. Detected failures are object of immediate "Replanting". Considering the criteria established for this plan in the (+ - 90 Hectares), one estimates that the project shall demand about 20 years to be completed. The execution of this plan was started in 2004 ( crosshatch in blue on partial 2014-plant shows the already planted areas). The company's partners, are at any time free to suspend the execution of this plan considering that it was an absolutely voluntary initiative. The Guapuruvu seedling (seen below) was planted early 2014. It grew 4 meters in 1(one) sole year. The single old Guapuruvu tree existing in the area, launched its very first seeds on Dec./2013. They germinated in the local greenhouse, and planted in different areas among the native seedlings. Actually the old tree was planted amid the Cunninghamias(china firs), over 65 years ago (decade of 1950). one of the sources, where Wm. Hering used purchase China Fir seedlings. During the past centuries, native high quality forests in Brazil were object of 'clear cut'. The wood was sold predominantly for export, furniture, even for firewood ( for trains ), etc. The consequence, of several centuries' of insensible clear cuts, was that the land became bare, or covered by the so called "capoeira" - 'under-growth-vegetation', which, unless being re-planted, would demand many centuries for genereating any usable hard wood. In order to supply the demanding wood market, Brazil imported exotic fast-growing-species, as Eucalyptus (from Australia), several sorts of Pinus (from southern USA),China Firs-Cunninghamias from China, Meta-Sequoias etc. Some of these might be harvested after 10 (ten) years'-growth, for pulp (paper mills), construction, firewood etc. After some decades, many bare areas became systematically covered by "exotic" forests. That happened also to the original area of the Castanheiras Farm. It is relevant to keep in mind, the drastic different conditions between Brazil and the Northern Hemisphere's countries, where, after the past centuries of 'clear cuts', "conservation" meant predominantly to preserve the undergrowth of new generations of native Pines, Firs, Oaks, Birches etc. allowing them to grow untouched. Spotted clearings were replanted with high quality native seedlings. Something, that is taken seriously in certain regions. It means: Conditions differ completely with what happens in the Southern Hemisphere (Brazil), where exotic fast growing species had been "imported", in order to replace the slow growing native species. The presently actual "exotic" forests became predominant in southern Brazil. Thus, the "Forest Reversion Plan" consists in proceeding a selective thinning of the "exotic" species and replanting the area with high quality selected native seedlings. That on the "intent" to provide "posterity" (after many centuries) with small "samples" of "Brazilian Atlantic 'planted'-native- forests". This is encouraged by government, but not at all being its dear costs financed. Actual action should be undertaken by government, on stopping the destruction of the Amazon-forests. Unfortunately the State has more to bother about, than caring for the preservation of such a huge precious asset. The so called "conservationalists" are powerless to exert any concrete influence! Few individuals shall execute this Reversion Plan.